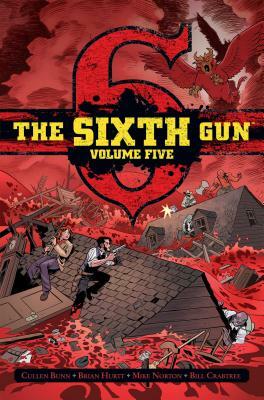 The Sixth Gun Volume Five Deluxe Edition collects issues #42-47 of the story arc “Hell and High Water,” as well as five-issue spin-off miniseries “Days of the Dead,” featuring guest artist Mike Norton. This oversized deluxe collection includes never before seen artwork, design sketches, cover galleries, and more, from the Eisner Award-nominated fantasy western epic. Mike Norton is the creator of the Harvey and Eisner Award-winning webcomic, Battlepug. After many years of Marvel and DC credits, he co-created Revival, the critically acclaimed Image Comics series, with studio-mate Tim Seeley and the Dark Horse series, The Answer!. He lives in Chicago with his wife and pugs. He is also very, very tall.